All Impala applications use Impala::CmdOptions to allow for to runtime configuration. Configuration may be done from (in decreasing order of priority) the command line, via a .ini file, or by relying on default values. Calling an application with --help will give an overview of the options. The --ini filename option allows for specification of a .ini file. The default .ini file is "name-of-the-executable".ini. 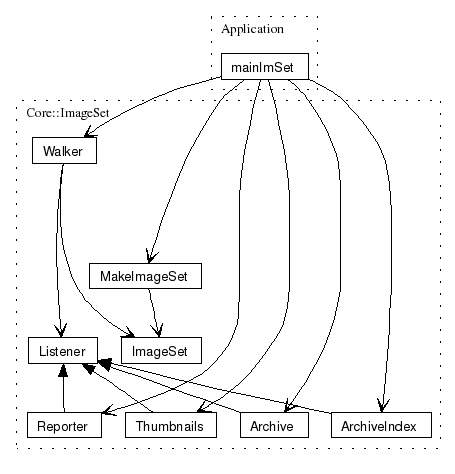 Processing of a set of images is done by Impala::Application::mainImSet in mainImSet.cpp. The general scheme in mainImSet is to walk over all images of all directories in a set, decode them and allow users/listeners to process the RGB data. In case imset was compiled as an MPI program the directories to be processed are automatically distributed over the available processes. specifies the type of work that needs to be done. 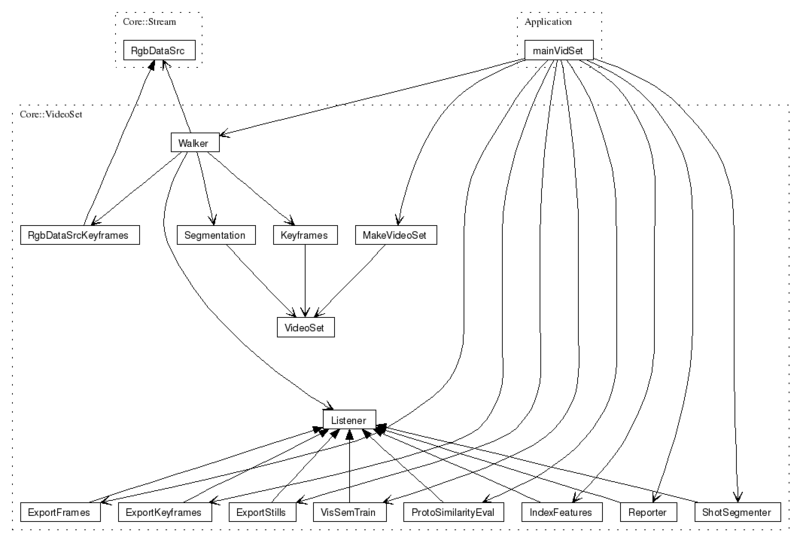 Basically indicates which specialization of Listener should be instantiated. the set of images or image segmentations to be processed. Processing of a set of videos is done by Impala::Application::VidSet::mainVidSet in mainVidSet.cpp. The general scheme in mainVidSet is to walk over all frames of all videos in a set, decode them and allow users/listeners to process the RGB data. In case vidset was compiled as an MPI program the videos to be processed are automatically distributed over the available processes. the set of videos or video segmentations to be processed. the number of frames to process in each video, -1 indicates all of them. The interactive video search is done using Impala::Application::mainTrecSearch in mainTrecSearch.cpp. Impala::Application::Table::mainTable in mainTable.cpp contains a number of table manipulation commands. Impala::Application::Server::mainServer in mainServer.cpp starts an image and video server. Impala::Application::mainShow in mainShow.cpp displayes .raw files. Impala::Application::mainPlay in mainPlay.cpp plays a video (without sound). Impala::Application::Util::mainUtil in mainUtil.cpp contains a number of general utility commands.